John Storrs Hall PhD, past president of the Foresight Institute, will be the keynote speaker at the L. Ron Hubbard Awards Ceremony, taking place April 15 at the Wilshire Ebell Theatre in Los Angeles. 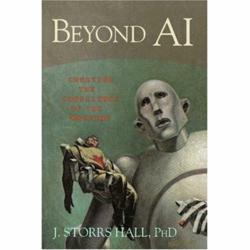 J. Storrs Hall most recent book has as its cover art a painting by famed science fiction artist and founding coordinating judge of the L. Ron Hubbard Illustrators of the Future Contest, Frank Kelly Freas. They are some of the milder innovations that nanotechnology could make not only possible, both economical and safe as well. Another is space travel. John Storrs Hall PhD will be the keynote speaker at the Writers and Illustrators of the Future Awards Ceremony, taking place April 15 at the Wilshire Ebell Theatre in Los Angeles, it was announced by Author Services, the ceremony’s organizer. Hall grew up reading science fiction from the genre’s great writers including Isaac Asimov, Robert Heinlein and L. Ron Hubbard. In turn, Hall was inspired to transform their science fiction into science fact. And what evolved from there was one of today’s most innovative scientists of cutting edge nanotechnology. He is involved in the field of molecular nanotechnology, is past president of the Foresight Institute, founder and moderator of the sci.nanotech newsgroup for a decade and is known as the originator of the Utility Fog concept. His most recent book “Beyond AI: Creating the Conscience of the Machine” (Prometheus Books) has as its cover art a painting by famed science fiction artist and founding coordinating judge of the L. Ron Hubbard Illustrators of the Future Contest, Frank Kelly Freas. Conceived by L. Ron Hubbard to provide a means for the aspiring writer or artist to have his works seen and acknowledged, the Writers of the Future has proven itself to be every bit a successful launching pad now with over 650 writers and artists having walked on stage to be recognized. The event takes place at 6:30 PM on April 15, 2012 at the historic Wilshire Ebell Theatre, Los Angeles, CA. Each writing and illustrating contest winner will be presented their trophy by contest judges at the ceremony and receive combined cash prizes and royalties of over $30,000. A time capsule with predictions from a quarter century ago from top scientists and science fiction writers on what life will be like in the year 2012 will be opened and the entire contents displayed for all to see following the ceremony. RSVP to contests(at)authorservicesinc(dot)com or call 323-466-3310. The Writers of the Future writing contest (http://www.writersofthefuture.com) was initiated by L. Ron Hubbard in 1983 to provide a means for aspiring writers to get that much-needed break. Due to the success of the Writing Contest, the companion Illustrators of the Future Contest was created in 1988. The intensive mentoring process has proven very successful. Past winners of the Writing Contest have published over 750 novels, 3,500 short stories and winners of the Illustrating Contest have had their art published in more than 500 books and magazines, with 4,500 illustrations, 350 comics and over 1.3 million art prints.